The color black has long been associated with mourning and death in many cultures. In the past, wearing black clothing to a funeral was regarded as the only appropriate choice. Many people still choose to follow tradition and only wear black clothing to funerals. However, today’s society has seen a relaxing of the “rules” so that other clothing is now considered appropriate. For women, a dress, a skirt suit or a pant suit, a blouse (with sleeves) or a sweater combined with a skirt are all appropriate choices. Flat shoes or pumps may complete the outfit. Plan to arrive at least 30 minutes before the service starts. 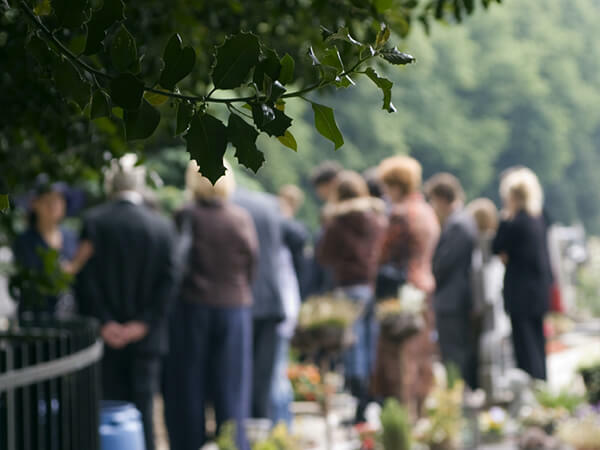 If you are going to participate actively in the service as a pallbearer, or will be delivering a eulogy, reading a passage, or performing a song, this will give you time to meet with the funeral director to review the schedule and prepare yourself for your part of the service. It is best to avoid clichés when expressing sympathy, although they are common and easy to communicate, they can be cold-feeling and often come across as “just something to say”. Avoid phrases like “I am sorry for your loss”, these phrases remove you from the situation and can come across as distant feeling to the bereaved. The goal of expressing sympathy is to offer your compassion and concern for the bereaved. You can say how much you will miss the person who died, or you can share a happy memory. The most important thing to communicate is that you care about the bereaved person and you are available as a source of support. If you offer your support in emotional or practical ways, do not put the burden of contact on the bereaved, if you want to talk to them or help them, initiate conversation or offered support.